Sooo... I LOVE THANKSGIVING. That's no surprise, right? I love food! And that's basically what it's all about. Well, that and bourbon cider cocktails and watching football and magical leftover concoctions 3 hours after dinner (turkey and stuffing sandwich, anyone?). Oh yeah, and spending time with family and giving thanks -- I'm always on board for that. 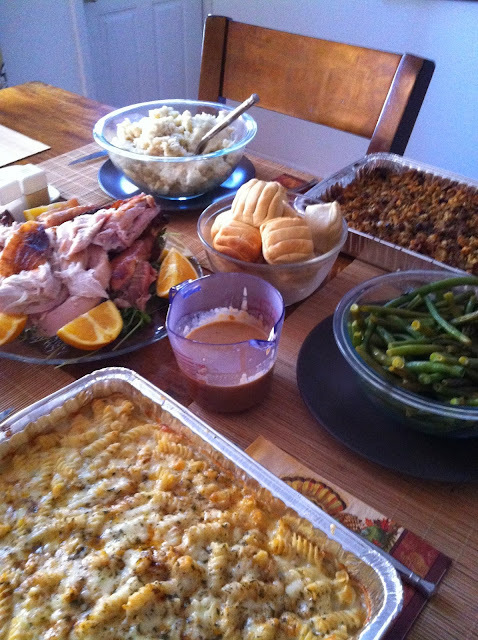 Last year was my first time cooking Thanksgiving dinner. Ryan had to work on the Friday after Thanksgiving so we decided not to travel home to Richmond -- instead, my brother came up from Virginia and I cooked a full-on Turkey Day meal for the two guys and me. My mom and stepdad also traveled up here later in the evening after another Thanksgiving meal for leftovers and continued celebration. So, I cooked for 3 immediately and 5 total. 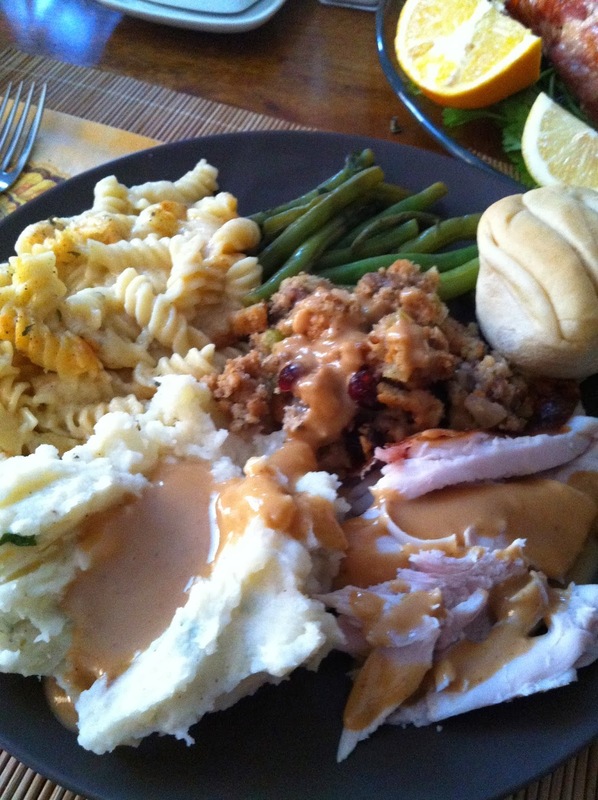 And let's just say I went all out for my first Thanksgiving meal -- it was WAY too much food and it was AWESOME. I thought I would share my favorite recipes from last year's Thanksgiving dinner -- the ones that were so good I plan to make them again! And actually, I plan to cook several of the same dishes again this year... because this meal turned out even better than I expected and I've been waiting a whole year to eat this stuff again! I'm sharing the recipes now, a full 2 weeks in advance, in case you're also planning for your Turkey Day -- these are highly recommended and were SERIOUS crowd-pleasers all around. 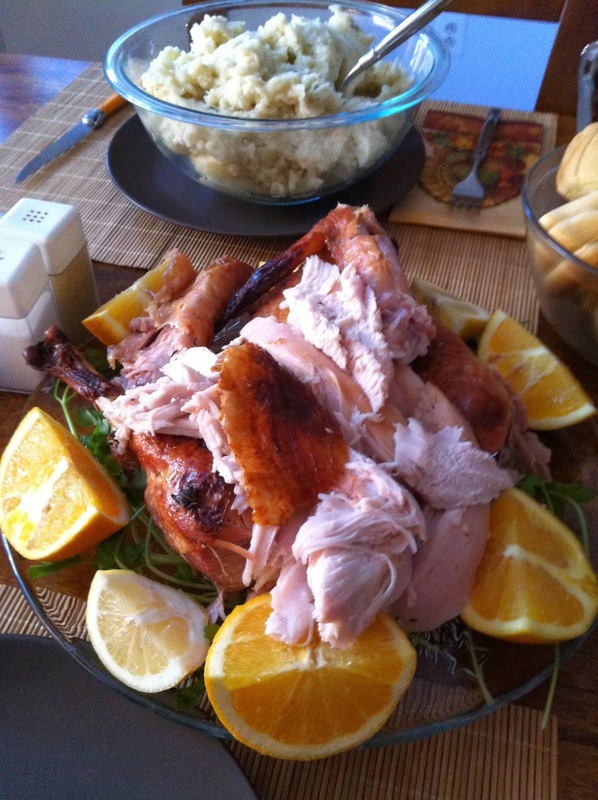 I was admittedly very intimidated by cooking a huge turkey last year -- I had never done it! I researched lots and lots of methods for getting a perfectly flavorful and juicy bird, and I have to say... I was SHOCKED at how well the one I chose turned out. I'm usually the one at the Thanksgiving table with a plate full of sides and just a bit of turkey... it always seems so boring to me in comparison to everything else! Not this one though. I couldn't get enough! Yes, it involves brining a huge bird in your vegetable crisper drawer overnight, which was a new cooking adventure, but it's totally worth it. 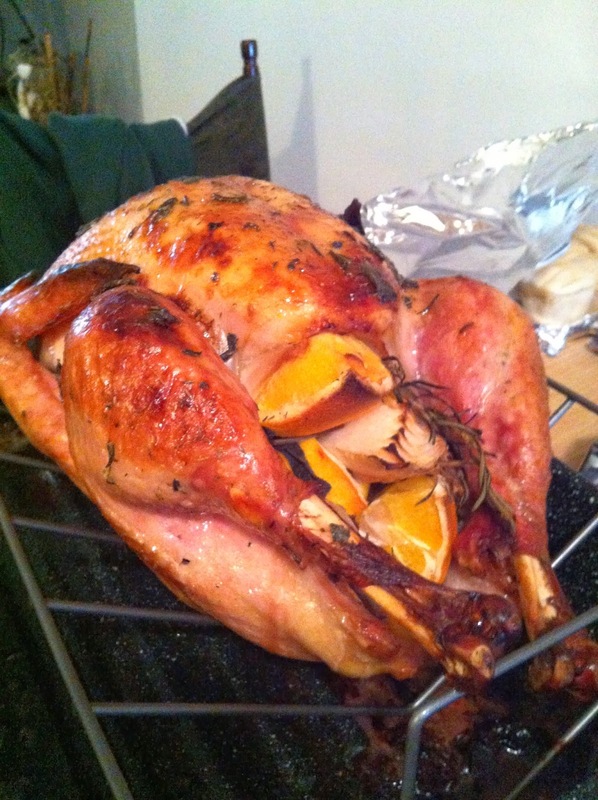 I know I'm bragging, but this was definitely one of the best turkeys I've ever had. Ummmmm yeah. Do you need to read the name of this dish again? How could that NOT be amazing? This has my pick for the best dish on the Thanksgiving table. I know there's some controversy over whether macaroni and cheese is a true Thanksgiving side dish, but in my book, it definitely deserves to be there! Any excuse to eat this is okay, to be honest. I adapted it from Beecher's mac 'n' cheese recipe, which is already the best recipe ever... or so I thought... then I added white cheddar cheese and gruyere. It's just too good for words. There's nothing else to say. Except make it. Please. Stuffing is another one of my Thanksgiving favorites. 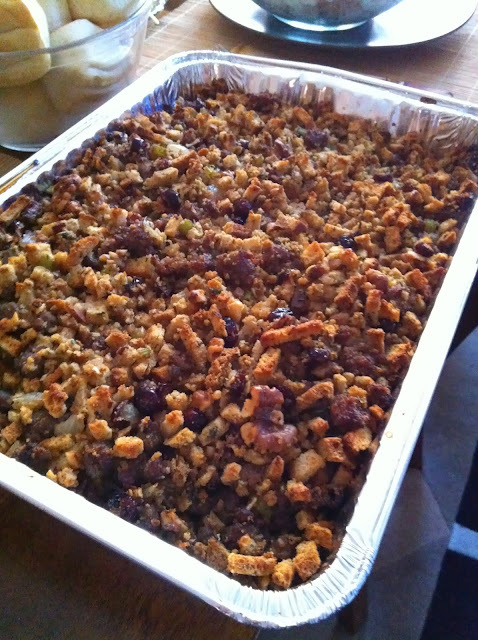 I think part of it is that I never eat stuffing unless it's Thanksgiving... it's such a splurge! And so freaking delicious and carb-y and awesome! Finding a stuffing recipe I was happy with last year was a bit of a challenge -- I couldn't find one that fit everything I was looking for in a perfect Thanksgiving stuffing. I knew I wanted it to have sausage and craisins and nuts, so I ended up adapting an already-delicious sausage bread filling recipe to include everything I was imagining. It turned out great! Exactly what I was looking for, and it will definitely be on the table again this year. I'm a little picky about mashed potatoes. 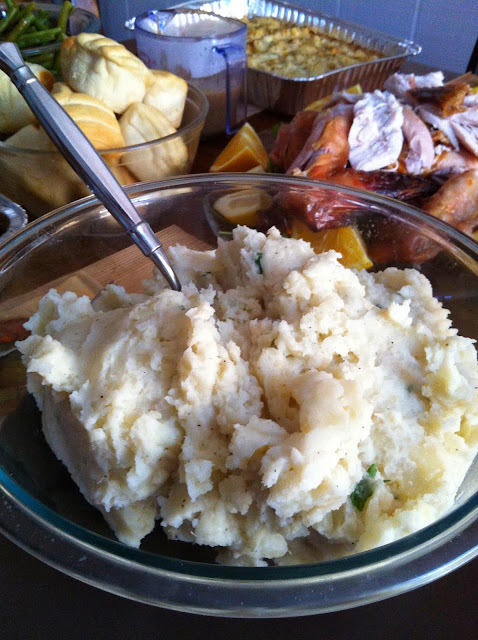 I often find other people's potatoes too whipped and creamy -- I prefer a simpler and more "rustic" mash. The kind you get from mashing with a big fork or potato masher... NOT a blender. I also don't think some of the add-ins people use, like sour cream or cream cheese, are necessary. All I want in my mashed potatoes: potatoes (obviously), butter (obviously), half and half (or heavy cream if you're feeling particularly devilish), salt and pepper... and ROASTED GARLIC. This obviously elevates them to another level. To me, these are the perfect mashed potatoes. Add on some of the homemade turkey gravy and it's basically heaven in your mouth. You won't find another mashed potatoes recipe on my table! That's it. Those are the dishes worthy of returning. I also made a chocolate pie but I'm not sure it was worth the effort (and I can't get Eat Live Run's chocolate bourbon pecan pie out of my head -- that just might be my pie's replacement). Lastly, I made green beans, but I think I'll do some different veggies this year. My lemon, garlic, and basil green beans were good but perhaps not "special" enough for Turkey Day. Any ideas for delicious veggie side dishes? I can't WAIT to make this meal again! Yes, it's hours and hours of cooking, but I have to say -- I loved every minute of it. What's not to love? It's a day at home with my love and my brother on a weekday, candles burning, football in the background, and amazing food aromas filling the house while I leisurely prepare an epic meal of 974673 calories. It's a once-a-year event! Want to give any of these a try? You totally should! Recipes below! -8 to 16 hours before cooking, make the brine: Place the salt, brown sugar, peppercorns, bay leaves, and 3 cups of the water in a medium saucepan over high heat and bring to a simmer. Reduce the heat to low and continue to simmer, stirring occasionally, until the salt and sugar are almost completely dissolved, about 5 minutes. Remove from the heat and let cool to room temperature. -Place a large resealable bag (find the HUGE ones at Walmart or Target) inside a 4-gallon container (most removable vegetable or crisper drawers are the right size). Open the bag and add the remaining 11 cups of water, apple cider, and cooled brine. Set aside. -Remove the giblets and neck from the turkey cavity and discard or save for another use. Remove any wire or plastic holding the legs together. Pat the turkey dry inside and out with paper towels. Place it breast-side down in the brine and seal the bag, squeezing out the air so that the brine comes about halfway up the side of the turkey. -Slide the drawer, or place the container, in the refrigerator and brine for 8 to 16 hours, turning the turkey once while it’s still inside the bag. -When ready to cook, heat the oven to 325 and arrange a rack in the lower third. Remove the turkey from the brine and thoroughly rinse it inside and out with cold water for at least 2 minutes. Discard the brine and bag. -Pat the turkey dry inside and out with paper towels and tuck the wing tips back and underneath. Rub a generous amount of the herb butter all over the outside. Place the onion, oranges, lemons, and herbs inside the cavity. Wind a piece of twine around each leg once and tie the ends together. -Place the turkey breast-side up on a roasting rack set in a roasting pan. -Roast until a meat thermometer inserted into the inner thigh registers 165°F to 170°F and the juices run clear. This took about 3 hours for a 13 lb turkey for me. -Remove the turkey from the oven and let it rest for 30 minutes before carving. Meanwhile, make the gravy. -Pour the drippings from the roasted turkey into a medium heatproof bowl. Let sit for a few minutes for the fat to rise to the top, then skim the fat off with a spoon and discard; set the drippings aside. -Place the roasting pan across 2 burners over medium heat. Scrape up any darkened or browned bits from the bottom of the pan with a wooden spoon. -Return the reserved drippings to the pan (it’s okay if a little of the fat goes into the pan) and sprinkle evenly with the flour. Whisk the flour and drippings together and cook, whisking occasionally, until the mixture thickens, about 3 minutes. -While whisking continuously, slowly add 2 cups of the stock or broth. Bring the mixture to a simmer and cook, being sure to whisk at the edges of the pan, until the gravy thickens slightly. If it seems too thick, add more stock or broth. -Pour the mixture through a strainer set over a medium saucepan over low heat. Discard the solids from the strainer. Stir in the cream. Taste and season with salt and pepper as needed. Keep warm until ready to serve. -Melt the butter in a heavy bottomed skillet over medium heat. Whisk in the flour. Continue to whisk and cook for 2 minutes. -Slowly add the milk, whisking constantly. Cook until the sauce thickens, about 10 minutes, sitting frequently. -Turn heat to low. Add 14 oz. of the white cheddar (reserve 2 oz), the gorgonzola, 2 oz of the gruyere (reserving 2 oz), the salt, garlic powder, mustard powder, nutmeg, and 1 tsp of the chile powder (reserve 1/2 tsp). Stir until the cheese is melted and all of the ingredients are incorporated, about 3 minutes. -Use immediately or refrigerate for up to 3 days. -Spray a 9x13 baking dish with nonstick cooking spray. -Cook the pasta 2 minutes less than package directions indicate. Rinse the pasta with cold water and set aside. -Combine the cooked pasta and cheese sauce in a large bowl and mix carefully. Depending on your preference for pasta to cheese sauce ratio, you MAY not need to use all of the sauce, so add it gradually until desired consistency is reached. Scrape the pasta into the baking dish. Sprinkle the top with the remaining ingredients: 2 oz white cheddar, 2 oz gruyere, and 1/2 tsp chile powder. -Bake uncovered for 30-35 minutes, until the top has a nice golden crust. Let sit for a few minutes before serving. -Heat a large skillet over medium heat and add sausage. Brown until it's cooked through, using a spoon to break into small pieces. Drain excess fat and transfer cooked sausage to a large bowl and set aside. -In the same skillet, heat the olive oil and 1 tbsp of the butter together. Add celery, onions, and garlic and saute until onions are translucent. Add craisins, sage, rosemary, salt and pepper. Mix and heat for another 2 minutes or so. Transfer mixture to the bowl with the sausage. -In a small skillet, melt the remaining tbsp of butter over low heat. Add the walnuts and saute until fragrant, being careful not to burn. Transfer to the bowl with sausage and add the bread cubes as well. -Using a large spoon, mix well to incorporate all ingredients. Adding 1 cup at a time, slowly pour in chicken broth. Mix well after each cup to test consistency. -Transfer mixture to a casserole dish. Bake uncovered for 1 hour. -Preheat oven to 400. Remove the loose, outer papery skin of the garlic. Using a sharp knife, cut off the tops of the heads, leaving the root end intact. Place the heads, cut side up, on a piece of aluminum foil. Drizzle with olive oil. Fold up the foil around the garlic, enclosing it in a pouch. Roast on a pan for 45-60 minutes. Remove and let cool. Once cool, squeeze garlic from the cloves into a small bowl and mix into a paste. -Scrub, peel, and chop potatoes into cubes. Place in a large pot and cover with cold water. Add 1 tbsp salt. Cover and heat on high until boiling. Uncover and simmer until potatoes are fork tender, 20-30 minutes. Drain well. -Return the empty pot to the stove on low heat and add the butter and half and half. Allow to melt and mix. Add garlic paste and stir for 2-3 minutes. Return the potatoes to the pot and coat with the cream mixture. Mash potatoes well with a large fork or potato masher. Add parsley and salt and pepper to taste. 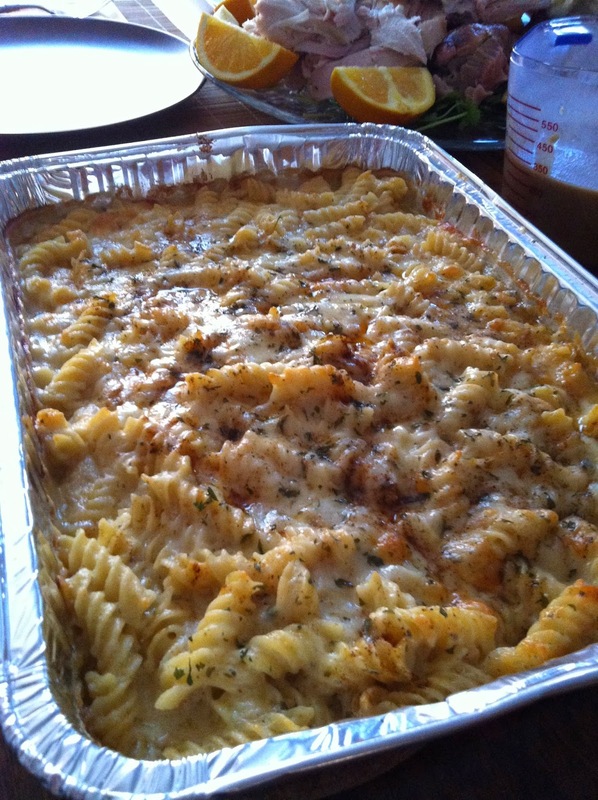 That mac and cheese....I just can't...no words. Come cook for me!!!! Taylor, everything looks delicious! I am only sorry to hear that you two will not be at my house this year! You will be missed terribly!. . .How about garlicky Swiss chard for a veggie? . . .easy and delicious! Hope to see you guys soon! 20-minute at-home full body "20 challenge"